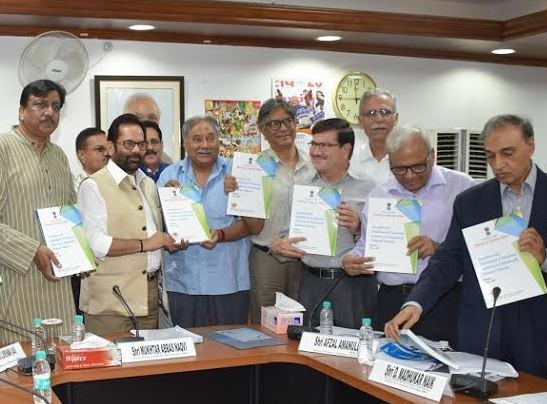 How an efficacious idea is proposed, acted upon and finally accomplished in lime and brick structure, has exemplarily been shown by Mukhtar Abbas Naqvi, the Minister for Minorities Affairs after he launched the report of the establishment of educational institutions for educationally backward minorities. Truly, for the first time, it was seen after 1947 that such a planned and time-bound educational strategy for the poor and backward minorities took a practical shape sans 70 years of mere lip service by the previous governments. Naqvi stated that under the aegis of Maulana Azad Education Foundation as part of the Prime Minister Narendra Modi’s dream of uplifting the backward minorities with any tag of appeasement with a view to empowering them, an 11 member committee joined the heads together in January 2017 and after a thorough research and interaction with a large number of academicians decided that among the minorities, it was the Muslim community that was found to be most backward and hence needed the state attention and intervention. Disparity was highest in rural areas for both boys and girls. The comparative difference of educational enrollment in all disciplines was alarmingly low. The members of the committee included Afzal Amanullah, Prof S Iqbal Hasnain, Lt Gen Zameeruddin Shah, Shahid Siddiqui, Prof Talat Ahmad, Sirajuddin Qureshi, Firoz Bakht Ahmed Prof SN Pathan, Qamar Agha, Kulsoom Noor Saifullah and D Madhukar Naik. According to Madhukar Naik, joint secretary, Ministry of Minority Affairs, he 147-page report records the surveys conducted in the country’s densely populated minorities areas to prepare an action plan aimed at the strengthening of the school base of the minorities, to provide skill development courses and avenues of completing graduation to the minority students and to create opportunities for higher education for them. It also contains a detailed demography of the minority concentration areas to the minutest pocket anywhere in India. According to the recommendation of the committee, christened as, “High Level Committee”, setting up of 211 Central Schools across the country (167 in minority dominant rural areas and 44 in cities ) is on cards. Incidentally, the first school under this plan will be inaugurated in Hyderabad tomorrow. From class 1 to 12, the schools will follow the CBSE curriculum with 30 students in each section. The states like UP and Rajasthan have already offered readymade designer and congenial buildings for these institutions. Setting up of 25 Community Colleges all over India in tune with the 2012 UGC guidelines has also been started whose clientele will be the drop out students to train them in skills. Besides, those interested in continuing the education will have the option to credit/ non-credit courses in addition to the special option for higher education for degree courses. Besides, 5 National Institutes of Excellence in the fields of Science and Technology, Health and Allied Sciences, Architecture, Planning and Design, Climate Change and Disaster Management, Renewable Energy and Food Security, will be the model seminaries in the days to come. These will be different from the usual IITs or IIMs based on the university system as excellence will be their watchword. These institutes, to be set up under the act of Parliament, will also offer programs of masters, doctoral and post doctoral levels. These will attract the best talent from within the country and abroad.